Suddenly ESPN/ABC is a lame duck in the NASCAR world, and on the very eve of its Brickyard 400 kickoff. A lame duck that won't reach the finish line of its current racing contract for another year and a half. Just as the stock car racing world -- and ESPN/ABC as the sport's major television network -- heads to Indianapolis Motor Speedway to kick off the 'second' half of the NASCAR Sprint Cup season, NASCAR CEO Brian France Tuesday afternoon announced a major new TV contract with NBC, beginning in 2015. The NBC-NASCAR deal is a socko 10-year package. There are still some holes in the sport's new TV game plan. But essentially ESPN/ABC and Turner's TNT will be out at the end of the 2014 season, and NBC takes over that key part of the schedule in the summer of 2015. NBC will be broadcasting seven Cup events on the network; the other 13 Cup events in the sport's second half will be on NBC's new sports cable channel, the former Versus network (principally known for its Tour de France coverage). 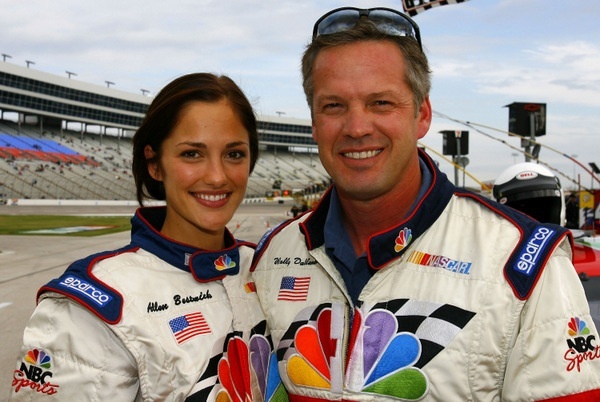 NBC was a major power in NASCAR racing from 2001 through 2006, a six-year run in which NBC posted some amazing ratings numbers with this sport. During that span, though, NBC carried 10 of its then 15-race package on the network: Indianapolis, Watkins Glen, California, Kansas, Talladega, Martinsville Atlanta, Texas, Phoenix and Homestead-Miami. It was in part to keep NBC interested in stock car racing that France created 'the chase,' the still controversial 10-race championship playoffs, in which the top 10 or 12 drivers just after Labor Day have their points essentially re-zeroed, to create a September-October-November 'playoff' system. Jimmie Johnson and crew chief Chad Knaus have dominated the 'chase,' winning five championship in that span. And they are well on their way to a sixth title this season...and they're early favorites to win Sunday's Brickyard 400, considered one of this sport's biggest events (despite its typical lack of action or drama). The last two years or so NASCAR's TV ratings have been either flat or down. Bringing NBC back to the sport looks like a big plus...however there could be a significant downside to the timing: how much incentive will ESPN/ABC have now to promote NASCAR for the next 18 months? Remember, when the 2006 TV ratings began to sink, France said part of the reason was that NBC was a lame duck and thus didn't have as much interest in promoting the sport. Might the same thing now happen again? It certainly is curious that France made this NBC announcement just hours before Indianapolis is to open the ESPN/ABC part of the tour. There are a number of issues to consider here, which will certainly be analyzed over the next several days. One big point -- a major aspect of the ESPN/ABC coverage of NASCAR racing has been ESPN's aggressive and wide-spread internet sports coverage. Indeed, ESPN's NASCAR journalists have become the sport's primary journalists (in part because of the precipitous collapse of the U.S. print media since 2008). ESPN, of course, covers more than just NASCAR; it has become the country's major sports outlet in general. Its NASCAR coverage has even been seen by some as somewhat marginalized by ESPN's wide-flung sports programming. Without NASCAR TV coverage as an anchor, it remains to be seen how staunchly ESPN/ABC continues covering NASCAR on its web sites. On the other side, NBC is trying to crank up its new NBC Sports cable outlet as a major challenger to ESPN/ABC on several fronts, undoubtedly including the web. Still, another issue still hanging over this sport in this realm is the upcoming change in Fox' own sports cable operations. Speed has been Fox' NASCAR/racing outlet, but that channel is changing dramatically. What that may mean for NASCAR racing is still unknown. All this is still unfolding. "NASCAR and NBC Sports Group announced today they have reached a comprehensive agreement that grants NBCUniversal exclusive rights to the final 20 NASCAR Sprint Cup Series races, final 19 NASCAR Nationwide Series events, select NASCAR Regional & Touring Series events and other live content beginning in 2015. Financial terms of the agreement, which runs through the 2024 season, were not disclosed. "With this partnership, NBC’s 20 Sprint Cup race schedule includes becoming the exclusive home to the Chase for the NASCAR Sprint Cup, NASCAR’s final 10 races of the season, including its season-ending championship event which will return to network television in 2015 for the first time since 2009. Of NBC Sports Group’s 20 NASCAR Sprint Cup Series events, seven will be carried on NBC annually, with 13 airing on NBC Sports Network (NBCSN). Four of NBC Sports Group’s 19 NASCAR Nationwide Series races will air on NBC, with 15 airing on NBCSN. "In addition to rights to NASCAR Sprint Cup and NASCAR Nationwide Series races, NBC has also obtained exclusive rights to practice and qualifying sessions for NBC’s national series events during their portion of the season, as well as rights to broadcast the NASCAR K&N Series, NASCAR Whelen Modified Tour, NASCAR Toyota (Mexico) Series, the NASCAR Hall of Fame induction ceremony and NASCAR’s season-ending banquets. Further, NBC has been granted Spanish-language rights, certain video-on-demand rights and exclusive TV Everywhere rights for its NASCAR Sprint Cup Series and NASCAR Nationwide Series events. "'We are excited about the cross-promotional opportunities NBC provides, especially in the timeframes right before NBC's NASCAR schedule and during the Chase,' said NASCAR VP of Broadcasting and Productions, Steve Herbst. 'We're confident NBC will utilize its powerful Championship Season lineup, including the NHL Playoffs, Premier League, the French Open, the Kentucky Derby and other events, to build interest and excitement for NASCAR. Those opportunities, combined with the opportunity to lead into the number one show on television – NBC's Sunday Night Football – for select Chase races, were both very attractive prospects when considering this partnership.'" Submitted by Fireball Roberts on Tue 07/23/2013 - 20:11. Last time ESPN failed to gain the rights to broadcast NASCAR races, NASCAR took away their ability to show same day race highlights. A dumb move by NASCAR, and hopefully they learned their lesson. If NASCAR refuses to allow ESPN to show highlights of the races this go-round, then if I were ESPN I wouldn't acknowledge that NASCAR races existed and would never mention the results or any of the news on that front. NASCAR went way too far with their "exclusive" TV rights contract when they first put it up for bid last decade. Let's hope they've gained some common sense since then. With the minions that run the circus though, I wouldn't count on that. Glad you addressed the ESPN journalism point. Submitted by Brian Cullather on Tue 07/23/2013 - 20:51. Submitted by Jeff Bell on Wed 07/24/2013 - 05:59. Sad days, but they seem to come more and more over the years. Of course, we can never go back, but I dream to the early days of ESPN when they pioneered television coverage for NASCAR. CBS got the ball rolling after the '79 Daytona 500, where before NASCAR was relegated to 10 minute snippets during Wide World of Sports, or a tape-delayed highlight show. I loved when ESPN came on at noon sharp and the pace car was peeling off of Turn 4 for the start. No tedious pre-race shows, no "through the field" spots, no endless pit road chatter, or details about every 1/2 pound of tire pressure each car took or where in the turn the front end loses grip. Just cameras focused on cars going in circles with commentators that had no agendas. It was new, exciting, and raw. The drivers, teams, etc were people we could relate to and love to root for or against. The drivers had their short track fans/rivals that followed them up to the big leagues. Now, no one has ever heard of these guys and there is no fan base. Now, it is the car # that is expected to embrace whomever drives it. Submitted by John on Wed 07/24/2013 - 09:46. I hope Brian France doesn’t wear his arm out patting himself on the back! Moving even more races from the over the air networks to a third tier network is going to make it even harder for a team owner to convince a Fortune 500 company to sign a sponsorship deal. Not to mention more commercials and higher fees passed on to the fans. Just wait until NBCSN gets into a dispute with Directv or Dish and then we get blacked out! Submitted by paul on Wed 07/24/2013 - 10:18. Great we have a fresh start here for announcers in the booth.Please please please nbc no dw in the booth on pit rd or even qualifing.We have heard all the danica is getting better junebug is my bet for today and how great toyota is.While you're at it leave hammond on the farm or at the tanning booth but not on pit rd pleeeeassssseeeee! First, nbc, put Kyle Petty in .He talks about the race and what's going on not what he wishes was going on.He calls the race without excuses for anyone who isn't or hasn't done there job in a long time.You can agree or disagree with him but he calls an honest race. Alan bestwick or mike joy would be another great pick.Both are great lead men. ok call me crazy but I think our own mike mulhurn would be a great pit announcer.He know everybody inside and out and knows the sport . Again nbc let dw stay in tenn and hammond at the tanning booth .Both have ran there course long ago. Submitted by Gina on Wed 07/24/2013 - 10:21. IMO, moving away from ESPN is a good idea. They haven't done a good job in promoting NASCAR, not the Nationwide series or the Cup series. ESPN is far more interested in stick and ball sports and it shows. Also, they seem to think we should all pretend along with them that the racing just began when ESPN took over, rather than acknowledge that racing has been going on since February. Although I like Allen Bestwick as a PXP guy, I'm not a fan of either Rusty Wallace or Brad D in the booth. ESPN is all about their "script" too for the races so they don't cover the actual event, they spend way more time trying to force what we see on TV to match up to the script. Will NBC be better? Who knows? I hope so, but then again, I've lost a lot of interest in NASCAR due to the introduction of so many gimmicks - and I include the chase in that group, rather than having the focus be on good racing. I used to make my weekend schedule around the races, now I might watch, if I'm around but it's no longer "must see". Not in person or on TV. Submitted by Chris Fiegler on Wed 07/24/2013 - 17:45.
Who will be the New Broadcasters for NASCAR on NBC? I think that NASCAR Will be Fine for NBC Sports & You Get Most All of the NASCAR Sanctioned Races on NBC. Maybe You Might Get also IndyCar on NBC after the 2018 Season. I think that will be Great that NBC Sports & NBC Sports Network might be the New Auto Racing Network.